Working with determining the corner weights on one axis isn't too bad. 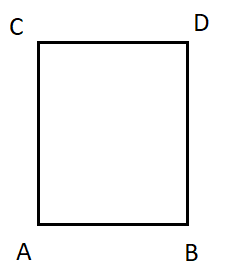 If A is to the left of the Center of Gravity and B is to the right of the Center of Gravity. You have two equations to work with. If I have a rectangle I can determine the weight on one axis for the left section and then determine the weights for the other axis. Since everything is parallel this seems to work out. However, once I have a trapezoid, things stop coming out. How would I determine this? 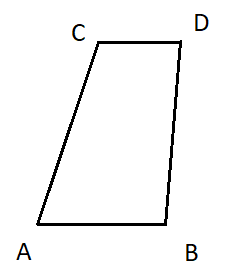 Also, is there a way to determine the corner weight of a quadrilateral that doesn't have any corners that are parallel to one another. In all the example, the Total Weight is known, the CG on the X axis and Y axis relative to a given Datum point are known. And all corner locations relative to that same Datum point are also known. A flat table with $n$ legs resists the total weight $W$ and the forces and moments are balanced. Each leg is located at $(x_i,\,y_i)$ relative to the center of gravity of the table. The legs run along the z-direction. Find the force $F_i$ on each leg. This means, that if we solve for the three degrees of freedeom $(\delta_z,\, \theta_x,\, \theta_y)$ we can calculate each leg force and sovle the problem. The sum of the forces must equal the weight, which yields one of the three equations needed. Using the above angles $\theta_x$ and $\theta_y$ in the force equation from step 3) yields the following solution (where $k$ cancels out). I wrote a quick (Fortran) computer program to test the above. I used 4 legs at $A=(-1,-1)$, $B=(1,-1)$, $C=(-2,2)$ and $D=(2,5)$. The source code is avaiable on GitHub as a gist. Not the answer you're looking for? Browse other questions tagged newtonian-gravity mass or ask your own question. How do I measure the total weight of a container with scales on four corners? How to calculate mass from compound lever? Is gravitation really a conservative force? Which would require less energy to rub the black board?